These may be background characters, but they are a very unique type of bird that can only be found the whimsical world of Meet Mr. Love & Mrs. You. 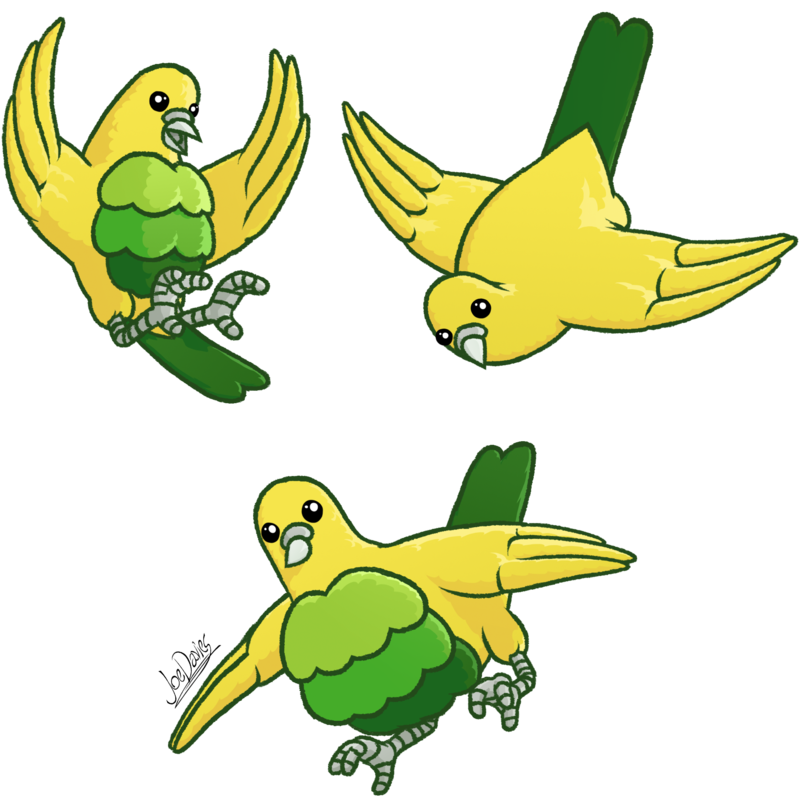 These yellow and green birds fly and tweet like ordinary birds, and they even use little sticks to build their nests. Yet, since everything in Meet Mr. Love & Mrs. You is made out of sweets, the little twigs are made out of chocolate. But their distinguishing feature is their fondness for lemon curd. And their… weird activities with the sweety substance. In the book, they gargle familiar songs with the curd, enough to make it ear-wrenching. But what is stranger is that they puff up after eating enough curd and explode, creating a splashing mess of curd all over the place. …If you think that sounds weird to you, trust me, I didn’t make it up. Check out the book to see it for real. 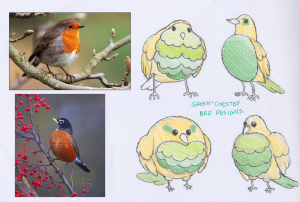 Designing their colour palette was easy. 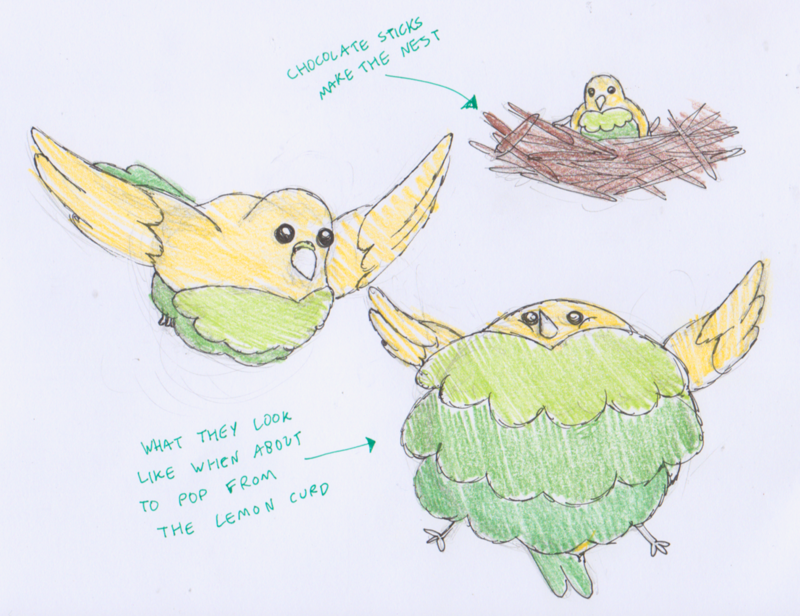 As birds that enjoy lemon stuff, they should be yellow, and a green chest gave them a hint of lime. Lemon and lime, get it? Their resemblance to robins was per Martin Small’s request, if I remember correctly. They actually haven’t been given a specific name in the book. 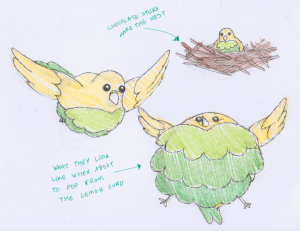 They’re not officially called “Curdie Birdies”, but I felt these unique little creatures deserve a name, so I made up this name for them.